The 11 Best Places to Celebrate St. Patrick’s Day in Nebraska! 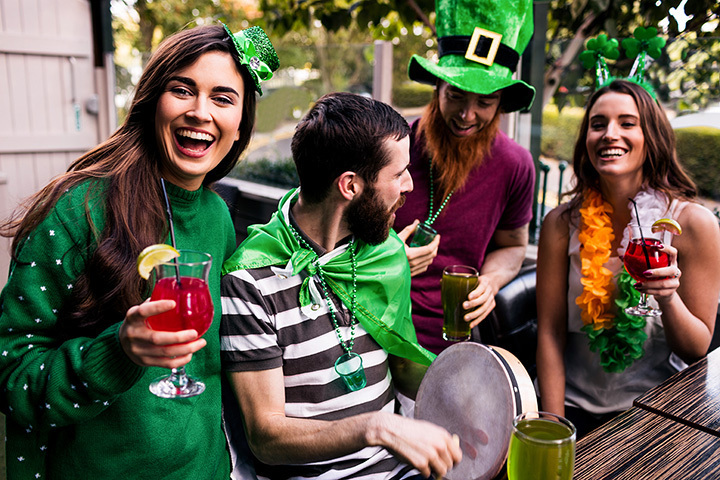 Recently, Omaha, Nebraska, was ranked as the third best city to celebrate St. Patrick’s Day, thanks to its large Irish population and low average beer cost. Of course, there are plenty of places to celebrate the day across the entire state. If you’re looking for the best St. Patrick’s Day celebrations in all of Nebraska, then be sure to check out this list! Each year the AOH St. Patrick's Day Parade marches through the Old Market area of downtown Omaha and features official viewing standards to catch all the sights and sounds. Afterward, the official AOH Post Parade party takes place at Annie’s Irish Pub with live music, food, and plenty of celebrating! O'Neill is Nebraska's Irish Capital and celebrates each year with a festive lineup of activities. The annual celebration kicks off with events like the Ms. Irish Pageant, a St. Patrick's Day Duch Hunt, the Greening of the Pond, and many more happenings. The day of the parade starts with the annual Shamrock Fun Run, and continues with a day full of live music, whiskey and beer tastings, and more. Get your beer bellies ready. Alderman's Bar in Omaha is a St. Patrick's Day favorite. Doors usually open at 6 a.m. for thrir Irish celebration followed by green beer in the outdoor expanded beer garden. Downtown North Platte comes to life for St. Patrick's Day each year with an exciting parade. Being one of the main parades in North Platte, you can expect incredible floats, plenty of spirited people, and lots of green! This local Irish-themed sports bar has been around for over 30 years and is known for its friendly neighborhood vibe. But perhaps more importantly, it has the best seats in town for the downtown Omaha St. Patrick's Day celebrations so get in early! The Shamrock Shuffle hosted by Kearney YMCA is an annual event held each year with a St. Patrick's Day theme. The 5K and 10K encourage costumes. so wear plenty of green! You'll be running for a good cause as all donations support the Make-A-Wish Foundation. Both races start and finish in the YMCA parking lot, see you there! Happening on St. Patrick's Day weekend, this famous pub crawl is the talk of the town, well, city. Each year the city's resident bar crawlers gather to be shuttled to participating bars and restaurants in Bellevue's Olde Towne area. St. Patrick's Day themed drink and food specials will be offered at most, and a lively good time is guarenteed! Want to celebrate St. Patrick's Day at the greenest place in Omaha? Then you must visit the Lauritzen Gardens for a unique workshop whose theme captures the excitement of St. Patrick's Day. Get ready to "gain the skills to create an elegant arrangement and help your inner designer bloom". The stunning botanical garden also make this a great alternative to day drinking! Each year, the North Platte Noon Rotary hosts a special St. Patrick's Day celebration. Gather with your town locals and Rotarians "for an evening of Irish fun, food and spirits". You won't want to miss this Irish experience, music included! Another Shamrock Shuffle, this time in Fairbury, is a fixture in most resident's St. Patrick's Day plans. Put on yur craziest St. Patrick's Day ensamble and head over to Chuckles Bar to get ready, get set, and go! Following the race there will be live music, food, green beer, Jell-O shots, and of course awards. At McKinney's Irish Pub in Lincoln, celebrations start early. On St. Patrick's Day the party starts at around 9 a.m. and goes on all day long. The street festival will have live music, bagpipers, contests (including a Lucky Charms eating contest), and much more to cap off this hurrah!